What is the Marathon Flat Free Tire composition? A Marathon Tires are made of amazing micro-cellular polyurethane foam that is comprised of trillions of tiny air pockets. This material eliminates flats, while creating the bounce and load handling characteristics of conventional air - filled tires. Marathon tires also have a dense outer skin for exceptional abrasion and chemical resistance. What happens when you wear through the skin? A Polyurethane foam is two times stronger than rubber, so it is extremely difficult to wear through the surface. Our solid tire is most dense at the outer surface, but is strong throughout the tire. Therefore, even if the outer surface is worn through, the tire will still perform exceptionally well. How heavy is a Flat Free Marathon Tire? A Marathon tires are nearly as light as air - filled tires. 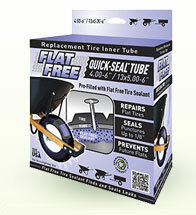 Most solid tire alternative are 2 - 3 times heaver than air - filled tires. 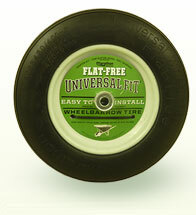 Our 8" wheelbarrow tire weighs only 2 pounds more than the average air - filled wheelbarrow tire. Will chemicals or weather affect the Flat Free tires? 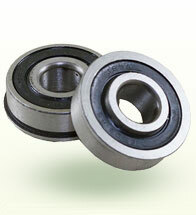 A Polyurethane is similar to rubber in regards to chemical resistance. However, unlike rubber, the tire is not affected by damaging UV sun rays. Marathon Tires will not dry out and crack like rubber tires. Will the Flat Free tire leave marks on the floor? A No! 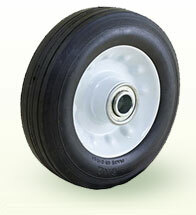 Unlike rubber tires, polyurethane is non-marking. Marathon tires are great for indoor use because the will not mark floors. This is the perfect tire for the delivery business and indoor tasks. Pneumatic (air-filled) and Semi-Pneumatic tires, however, can mark the floor as they are made of rubber, not polyurethane foam. How do Marathon Flat Free Tires compare on performance? 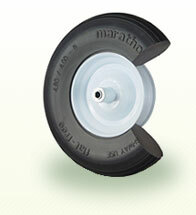 A Marathon flat free wheels look and feel like air-filled wheels and can handle the same load capacity. Because they are designed to mimic air-filled tires, Marathon tires provide superior performance in the flat-free tire market. Most flat-free alternatives are much heavier and offer less bounce than the Marathon tire. Where can I buy Marathon Tires? A Marathon Industries has set up a distribution network throughout the United States. Marathon tires are sold in nearly every state. Please contact Marathon Industries to find a distributor in your area. If we do not currently have a distributor in your area, we will be happy to work with you to establish one. Will the Marathon Tires fit my equipment? 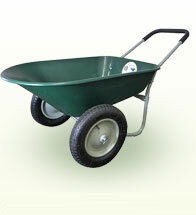 A Marathon Tires are designed to fit the majority of wheelbarrows and hand trucks in the market. If your tires have special hub or axle requirements, we will work with your to meet your needs. I have my tire size, but I don’t know what it means. How do I read and understand tire sizes? 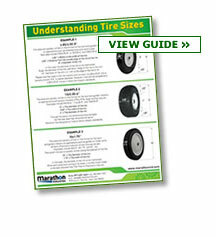 A Click here to view our "Understanding Tire Sizes". Why does the actual diameter and width of your tires not exactly match the tire size? A Tires in the tire industry are not exact. We've designed our tires to meet industry standards. 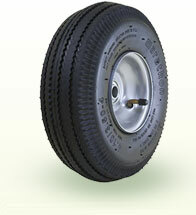 The diameter and width that we provide in the tire specs is based on averages. Tires may vary slightly in size. For more information on understanding tire sizes, please see previous question and answer. 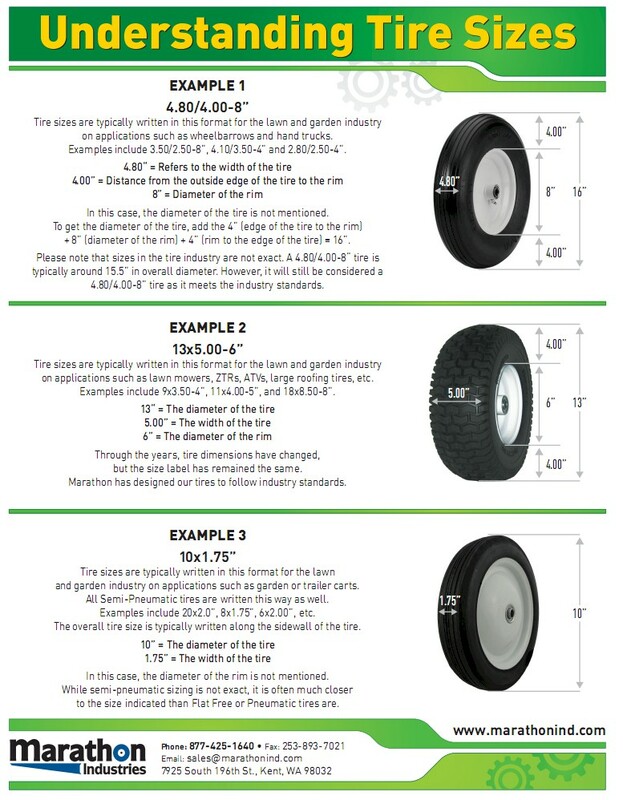 Do you offer tire sizes that are not shown on your literature? A Marathon Industries is continuously working to increase our production lines. If you do not see your desired tire listed, please call and let us know. Toll Free 1.877.425.1640.